Many people require divorce decrees for certain applications overseas, but sometimes in the difficult time that divorce poses, no records were kept and they do not have a copy of their divorce decree or even case number. If you were married in South Africa or had your marriage registered in South Africa, you would have been set as MARRIED on the Department of Home Affairs (DHA) system and would at that stage have been able to obtain an unabridged marriage certificate. If you then divorced, you would need to have registered the divorce on the system too, by going into a DHA branch or SA mission abroad. Thereafter, you would not be able to obtain a marriage certificate, but a letter of no impediment stating your DIVORCED status. When someone is asked to produce a divorce decree, it usually means they require the front page of the decree only, stamped and signed by the High Court or court in which the decree was issued. Sometimes, the divorce decree and full settlement are required, which means the whole document that your and your ex-spouse signed and agreed upon to divorce each other legally. 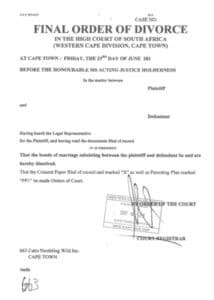 A typical South African divorce decree page looks a little something like this (names and details removed). Simply click to enlarge the divorce decree. The format may differ slightly of this front page, but usually the stamp from the High Court is in red ink and without ink stamps and signatures, the document can often not be used as it would then only be a copy. Thankfully, unless you have absolutely no details of the divorce and cannot remember the court it took place in, obtaining one is not a long process, but definitely a difficult one. Members of the public and foreigners often do not even have access to the places that lawyers can go in the High Court to obtain the divorce decree documentation. The minimum information needed to obtain a divorce decree quickly is the divorce case number and the court in which it took place. Without the case number, the exact date and court would allow a lawyer to search the divorce records of that year, month and date and find the divorce case number and decree in that method. With only a year (no month or day), the lawyer would have to search through all the divorces of that year in that court. Even worse, some people only know which city they were divorced in, but there are several courts to search within each major city in South Africa (e.g. Durban has three). Sometimes people have an old scanned copy of the divorce decree and this contains all the above information and more! So, if you do have a divorce decree and are reading this, go and scan your current copy now. It may prove worthwhile and save you a lot of time and money in future. Once you have the document, some countries or authorities just need an original and others need it to be apostilled or attested. 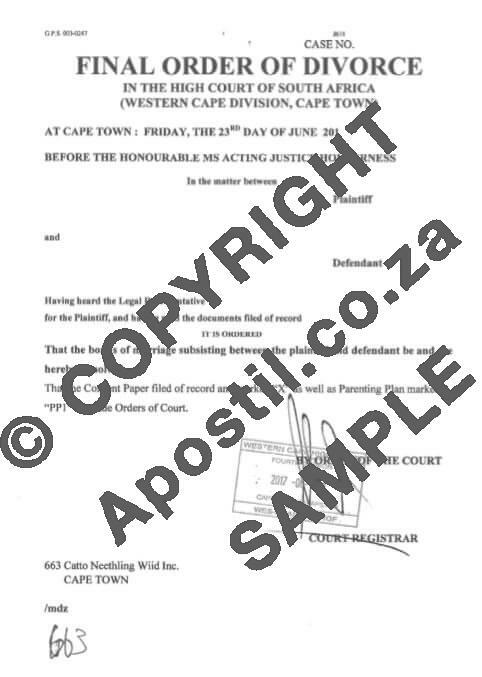 If apostilled, DIRCO will be verifying the court and not the document. What does it cost to obtain the divorce decree? Before attempting to search for your divorce decree in South Africa, find out exactly what you require and then contact us to find out an estimated timing and pricing. For example . Generally speaking, the pricing for divorce case numbers and decrees is the following, also displayed on our pricing page. If you need a divorce document for South Africa, get in touch right away on email or phone, as we can assist you at least in getting closer to having it in your hand, even if we cannot obtain it right away.